This soccer passing drill helps to develop the one-touch passing technique and practise different passes. 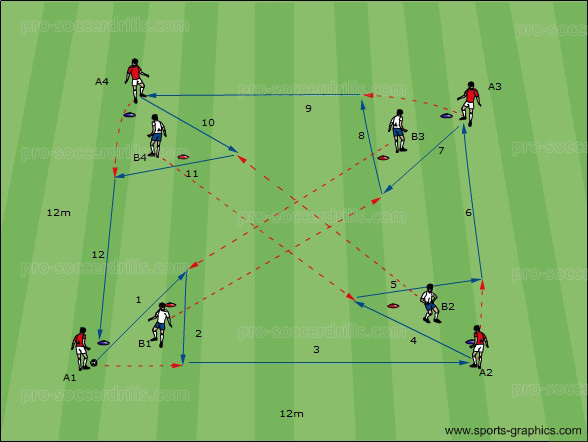 The passing exercise also focuses on soccer vision and the ability to create passing channels. Players and equipment are arranged as shown. Players stay in their positions along the soccer drill. They change for the coach’s sign. This passing exercise is performed in both directions. Distances must be adequate to the age group. This soccer passing drill begins from one of the players standing next to the sticks on the side. The passing drill is performed with one ball. P1 starts the soccer passing drill by passing the ball to P2, who makes a wall pass with P1 and plays the ball to the sideway moving P3. P3 lays it off to the arriving P1, who makes a sharp, deep pass to P4. He makes a wall pass with P3, then plays the ball to the sideway moving P1. P1 lays the ball off to P3, who makes a sharp, low pass to P1. Then the soccer passing exercise continues. 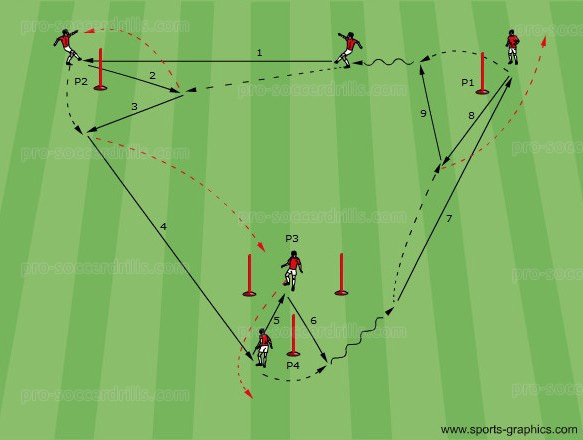 Soccer Passing Drill 1: In this variation players in the middle practise receiving skills and wall passing with the outside players. 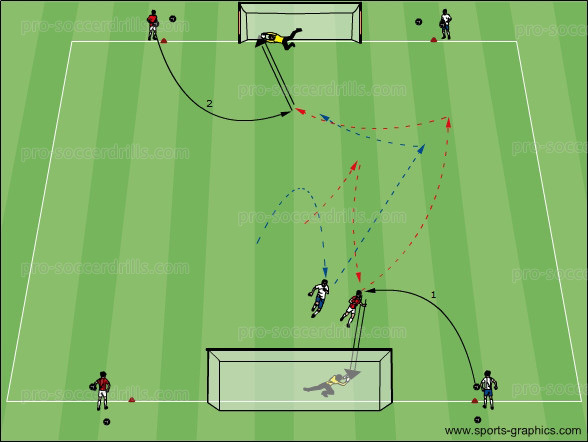 Soccer Passing Drill 2: In this variation players practise one touch passing and wall passing.